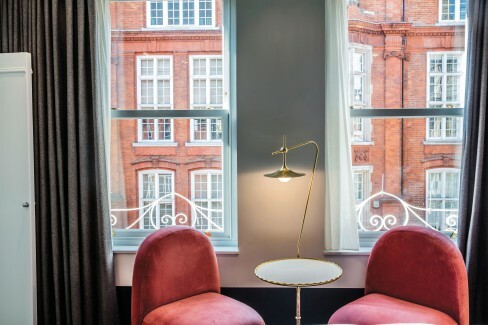 London’s picturesque Covent Garden neighbourhood is home to the bedazzling 18-room Hotel Henrietta, designed by French designer Dorothee Meilichzon. The delicate lamp and softly upholstered chairs with the view of red-brick buildings make for a cosy corner in the room. 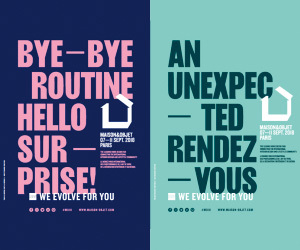 Ellen Lipton once said “Design is as much an act of spacing as an act of marketing”. Theming interiors is a tricky job, with the constant fear of coming off as ‘tacky’, but with the designers keeping in mind functionality and form along with aesthetics the spaces can do much more than just please the clients as is the case with this project. 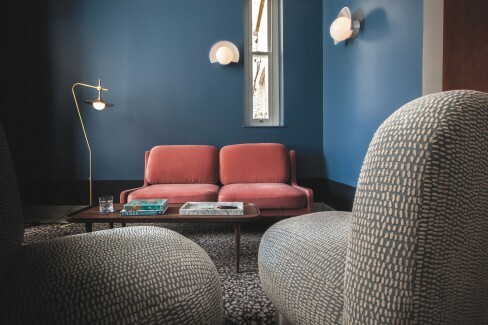 Events and consulting company, Experimental Group’s latest offering is the very chic Hotel Henrietta, an 18-room boutique hotel that also boasts of a restaurant by the same name, by renowned chef Ollie Dabbous. Designed by Dorothee Meilichzon, founder of Chzon – a global design agency that specialises in hospitality design, the hotel is fashioned more along the lines of an intimate B&B, but interlaced with an inimitable exclusivity. “My first inspiration for the hotel was the street itself,” Dorothee says. The hotel’s structure consists of two typically British buildings dating back to 1874 and 1877 (nos. 14 and 15 on Henrietta Street respectively) joined together in a modern endeavour. Yet, it still retains its old-world charm. 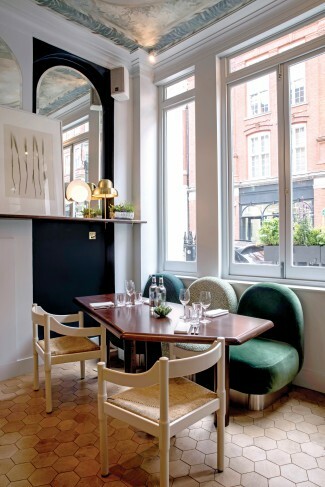 The dark textured flooring, upholstered chairs, and textured panel on the right completely enliven the dining area. Collaborating with Romee de Goriainoff, Olivier Bon and Pierre-Charles Cros, the founding members of Experimental Group, Dorothee masterfully brings in her own signature style, which is both sophisticated as well as inspired by the region. For us, the most striking aspects of the hotel are its colour palette and experiments with various textures. The understated colours bring out the quiet elegance that is quintessentially Dorothee Meilichzon, and the different kinds of textures work as elements of modernity allowing for the space to be viewed in a different light. What a delightful kitchen counter! Almost like dining out in the countryside. Notice the different types of light fixtures bringing the Experimental Group’s bohemian spirit into play. Covent Garden used to be the vegetable garden adjoining Westminster Abbey. Later, it was a spot for a fruit and vegetable market. 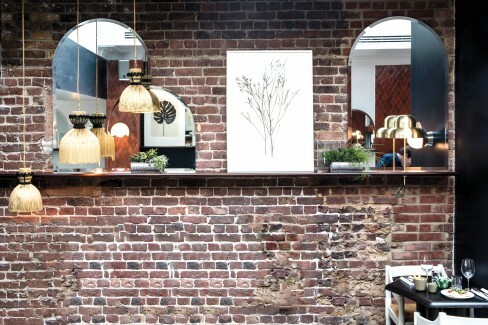 Keeping this history of the locality in mind, Dorothee chose a palette with natural tones. “I have used a lot of organic elements,” she says. Terracotta tiles, hand-made in France, were used for the walls, ‘a mix of green fabrics, end grain wood on the floors, and hand-painted glass ceilings that draw inspiration from endemic graphic motifs like the design of the arches of the market – it’s almost as if we are back in the nineteenth century marketplace. “There are four different harmonies of colours to make each of the eighteen bedrooms different,” Dorothee goes on. Taking inspiration from the antique interiors and ornamentations found in Milanese apartments as well as old London buildings, massive headboards have been designed with a mix of elements like mirrors, fabric panels, hand-painted patterns, etc. Cut and painfully assembled by hand, the headboards, which are essentially oversized like a bas-relief, are quite the modern retelling of an old and classical design style. The rooms mirror the architectural profile of Henrietta Street with colonnades, capitals, pediments, neo-antique porticos and skirting in white Carrara marble. “The carpets,” Dorothee adds, “have patterns inspired by the shape of the terrazzo.” The antique spirit of the room is further enunciated in the kind of furniture and light fixtures that have been used. Cabinets and dressers are suspended, and along with the rooms’ marble plinths, terrazzo-patterned custom carpeting, windowed arches, and bed side lights in brass add to the antique vibes of the rooms. The real drama though, is inside the bathrooms! “The basin areas,” Dorothee begins, “have been conceived as a fountain: two large pieces of granite at a right angle with a large mirror.” The shape and design of the basins are inspired by an old building on Henrietta Street. “The flooring is more traditional with black and white octagonal tiles and cabochons,” Dorothee goes on. 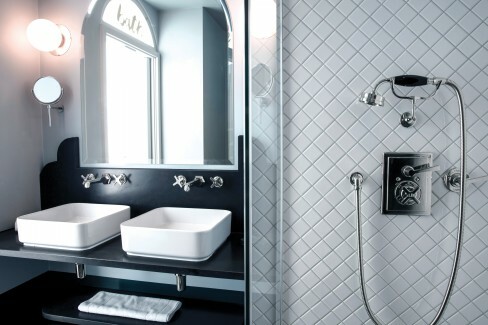 All bathrooms are equipped with massive showers and bath areas with clawfoot tubs on black and white octagonal tiles – quite perfect for two we’d like to believe. And with a bottle of Chatreuse from the well-stocked mini bar, the romance in the air would definitely be palpable! 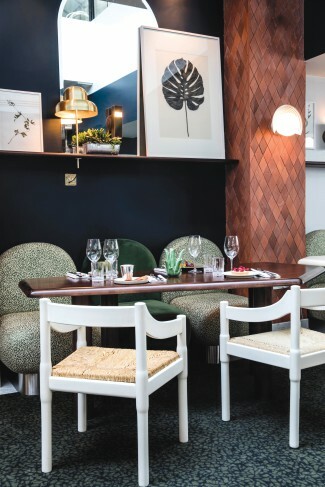 The hotel’s ‘true beating heart’ is its restaurant Henrietta, ‘an elegant synthesis of Victorian ornamental art and the brilliance of Art Deco.’ Chzon and Dorothee are known world over as specialists in hospitality design, and one can see why! 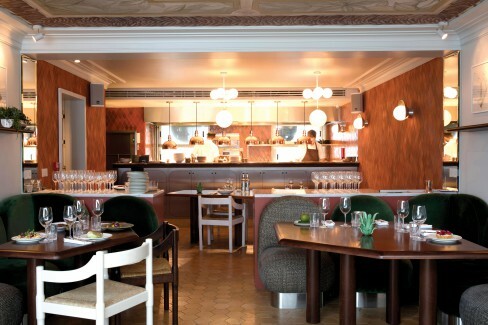 Spread across the glass-roofed mezzanine and the ground floor, the restaurant is Experimental Group’s collaboration with Chef Ollie Dabbous. The menu is a testament to Chef Ollie’s gastronomic expertise. “We have three counters;” Dorothee says, “two cocktail bars where people eat and a live kitchen counter where Chef Ollie works.” The restaurant’s open kitchen seamlessly merges into the dining room. Notice the flooring and colour scheme in this frame. The mix ‘n’ match table and chair adding to the quaintness of the space. Experimental Group’s ‘bohemian chic’ personality is what Dorothee Meilichzon brings to life with rich colours, mosaics and fabrics. 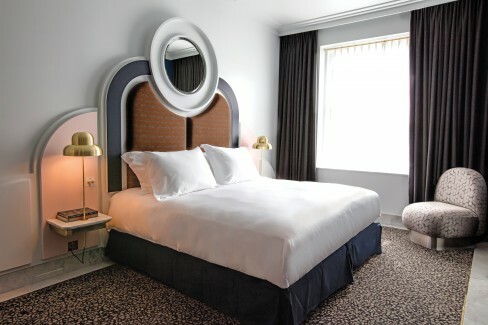 Hotel Henrietta is the perfect embodiment of the slogan bed and beyond!